Around the holidays, my boss got a box of Godiva Hand-Decorated Parfait Chocolates as a gift. One day she let myself and Izzy each pick one to eat. I never would have guessed that it would be such a difficult task! There was no "guide/key" to the parfaits, there was only a tag on the outside of the box with a list of each type. Later, we discovered that on the bottom of the box (hello -- how are you supposed to read that without awkwardly holding the box up and bending your head to read it, or flipping the box over and ruining all of the parfaits??) were descriptions of each parfait. Descriptions, but no pictures. I was trying to avoid the caramel parfait. It's just not my favorite, and I would have preferred a non-fruity dark chocolate something. We studied those descriptions from the underside of the box and the actual parfaits for over 10 minutes. I finally decided on one I thought was the Mocha Almond. Bit into it... caramel! Arg! Later our boss picked one out for herself -- she doesn't like mocha. Not at all. I don't remember what she thought she had (after we went back and forth between the descriptions and the actual parfait, and were fairly certain we had it right), but she bits into it and... you guessed it: mocha. What are the chances?! Now, I do realize this is a ridiculous #FirstWorldProblem, and I'm thankful the chocolates were offered to me after they were received as a gift. That being said, a company as well-known and successful as Godiva should have a better-labeled product than that. If someone's going to spend $60 on chocolates, you'd best be able to identify them. And in the hopes of getting some free chocolates, I decided to write a consumer complaint letter. I've done this once before, in 2008 when I found a piece of string in a bag of Eileen's Southwest Trail Mix that I snacked on every day at my job. Again, the main hope was that I would get some free trail mix out of it; I wasn't too concerned about the small piece of string I found in the previous bag. They did send me an unmarked bag of trail mix, and it tasted the best and freshest of all their bags I've ever eaten! On December 26, 2012 our office received a gorgeous box of 16 Godiva Hand-Decorated Parfait Chocolates. Unfortunately, we were unable to identify each parfait, since there were no labels in the box. There was a list of each type of parfait on a tag wrapped outside of the box, but it was simply a list without any corresponding pictures. We later discovered detailed descriptions of each parfait on the bottom of the box (an inconvenient location), but again without matching pictures it was difficult to figure out which parfait was which. How is one to know the difference between "chocolate bits," "chocolate ribs," and "chocolate curls"? Both of the parfaits that were covered in "chocolate bits" were also both in dark chocolate cups, so there was no way to tell them apart. We also couldn't distinguish between the "strawberry cream" and the "raspberry cheesecake," which was a disappointment to Jacob, our office manager who loves strawberry but cannot eat raspberries. I am displeased because we weren't able to enjoy these parfait chocolates as they should have been, since we could not tell one from the other. Each of my coworkers have their own preferences, but I am not a fan of caramel. After going back and forth, studying the descriptions on the underside of the box and comparing them to the parfaits inside, I chose which one I would eat. I went out of my way to avoid the caramel parfait, and as luck would have it, that's exactly the parfait that I bit into. People should not have to do this much guesswork to select the parfait they would like to enjoy (and choose incorrectly on top of that!). The presentation of the Parfait Chocolates was impeccable; the box was beautiful. However, the lack of labels or pictures with the descriptions prevented me and my coworkers from delighting in this holiday treat. To resolve the problem, I would appreciate a replacement box of Godiva Chocolates -- with labels. 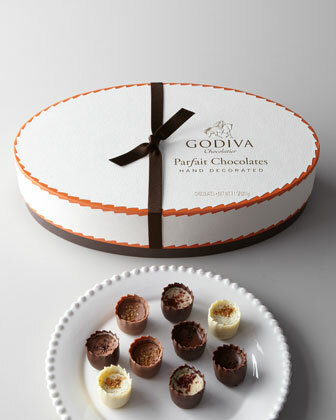 The best solution would be an identical box of the Hand-Decorated Parfait Chocolates with labels, but if such a label is still not in existence, a different box of labeled Godiva chocolates will suffice. I look forward to your reply and a resolution to this problem. Thank you for your email and your inquiry. I am making out an official complaint form for you, and it will go to management for their review. May your life be filled with Godiva! And then I got back to work and the days passed and I forgot all about it. ... until a package arrived for me today at work. Here's what I found inside! I forgot to take a picture of the chocolates inside, but they are all very distinct shapes and there is a great key with photos that was included inside the box.